On the afternoon of April 28, 1996, Martin Bryant snapped. A striking figure with his long blond hair and milky skin, he had just eaten lunch at a café within the historic site of Port Arthur, a former prison in Australia's island state of Tasmania. Described later by his sentencing judge as a "pathetic social misfit," the 28-year-old then reached into his sports bag and, in the manner that others might pull out a sweater, withdrew two military-style semi-automatic rifles, which he used over the next eight horrifying minutes to kill 35 people  men, women and children  in what remains Australia's worst mass murder. Sharing the shock of his people, the newly elected Prime Minister, John Howard  just two months into his eleven-and-a-half years in power  seized the chance to overhaul Australia's gun laws, trampling all opposition to make them among the strictest in the developed world. "I hate guns," he said at the time. "One of the things I don't admire about America is their slavish love of guns ... We do not want the American disease imported into Australia." Howard argued the tougher laws would make Australia safer. But 12 years on, new research suggests the government response to Port Arthur was a waste of public money and has made no difference to the country's gun-related death rates. 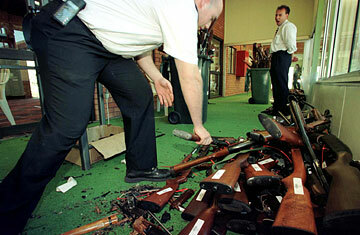 Though he'd acquired them illegally, Bryant used guns at Port Arthur that were lawful in Tasmania at the time. Howard argued there was no reason civilians should be allowed to own assault weapons  and under the 1996 National Firearms Agreement (NFA) these were all but banned. At huge cost, the government bought from their owners some 650,000 of the newly prohibited guns, which police destroyed. It also implemented mandatory gun licenses and registration of all firearms, helping to restrict to 5% of the population the number of Australian adults who owned or used guns last year, down from 7% in 1996. But these changes have done nothing to reduce gun-related deaths, according to Samara McPhedran, a University of Sydney academic and coauthor of a soon-to-be-published paper that reviews a selection of previous studies on the effects of the 1996 legislation. The conclusions of these studies were "all over the place," says McPhedran. But by pulling back and looking purely at the statistics, the answer "is there in black and white," she says. "The hypothesis that the removal of a large number of firearms owned by civilians [would lead to fewer gun-related deaths] is not borne out by the evidence." Firearm homicides in Australia were declining before 1996 and the decline has simply continued at the same rate since, McPhedran says. (In 2002-3, Australia's rate of 0.27 gun-related homicides per 100,000 people was one-fifteenth that of the U.S. rate.) Of course, it's possible there might have been a spike in firearm homicides  and one or more Port Arthur-style events  if not for the gun law reforms. "It's very easy to raise what-ifs," McPhedran counters. "The what-ifs are interesting as discussion points. But, ultimately, for policy making, we have to deal with what is." And suicide by firearm? Here again, rates were falling pre-1996. And while the decline gained speed after 1996, suicide by other methods began declining then, too. McPhedran and coauthor Jeanine Baker say suicide needs to be examined in a broader context that includes growing public awareness of mental health issues and increased use of antidepressants. Other researchers have focused on mass shootings: there were 11 in Australia in the decade before 1996, and there have been none since. This appears to be a strong argument for gun laws designed to help prevent massacres like Port Arthur. But McPhedran argues that because "mass shootings have been such a rare event historically ... it's incredibly difficult to perform a reliable statistical test on such rare events." Massacres, she argues, are a separate research question. It won't seem irrelevant to some that McPhedran and Baker are affiliated with the Sydney-based International Coalition for Women in Shooting and Hunting. But it should be, McPhedran argues: their analysis has been peer-reviewed, approved for publication and should be judged on its merits, she says. The authors are not recommending that the gun law be repealed, though they do write of their hope that their findings might give policymakers "greater confidence" in approaching firearms policy in the future. "We've set out to scientifically investigate what was happening [with gun deaths] before and after 1996," she says. "We are simply presenting the evidence as it stands." The new Kevin Rudd-led Labor government has no plans to review the existing laws.